If there’s one thing I’m good at, it’s not being good as things. But given my delightfully blinding optimism, I plunge on ahead anyway, learning a ton with each monumental goof. 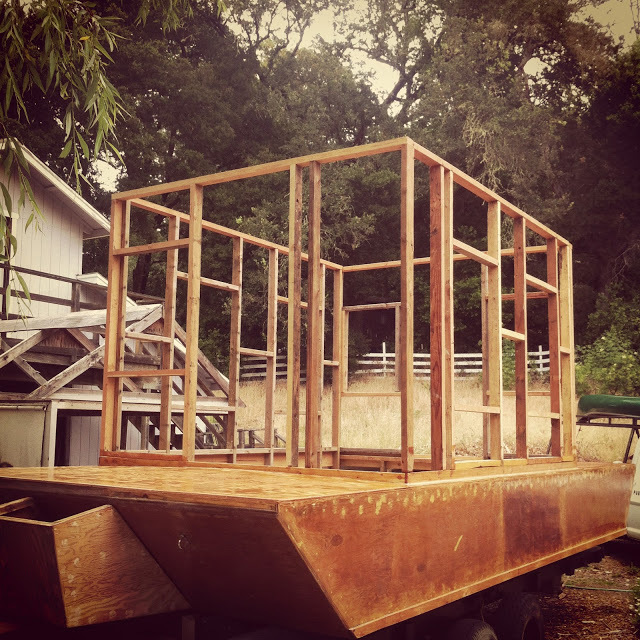 You remember the cabin framing looked like this. That’s more or less an eight foot wall, with maybe 1 foot 8 inches below the deck of the hull. The height was chosen more or less arbitrarily, based I think on having 8 foot two-by stock to work with for the framing. 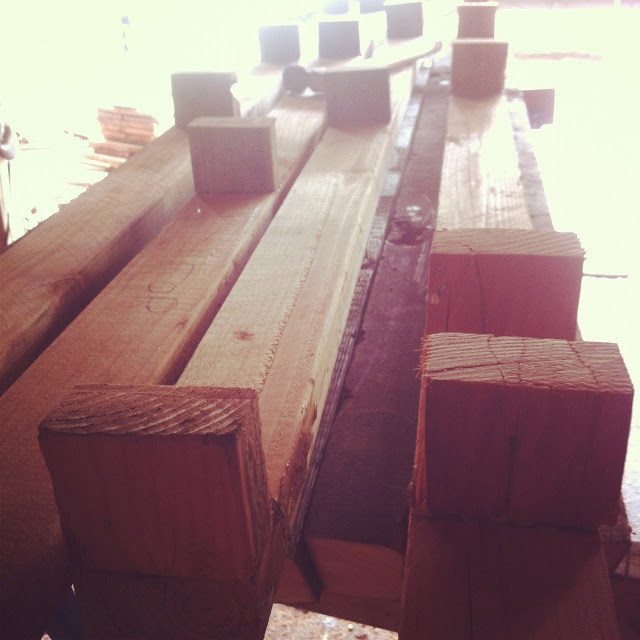 At this point I’m thinking all the great and rare 1×12 redwood we pulled from the decommissioned chicken coop was not going to be enough wood, and was gong to be too brittle, too bug eaten or rotten, and too heavy. So I was pricing new redwood, though this was not my ideal. 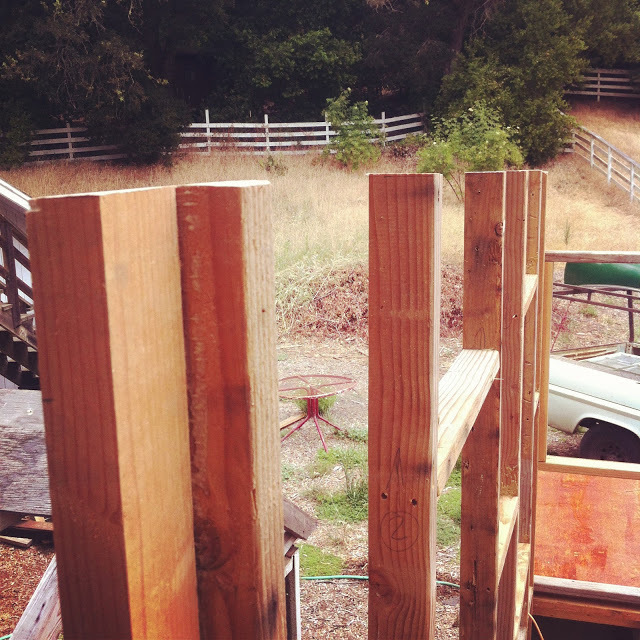 When I got down to thinking about (and pricing) the redwood siding, I realized I’d made a small but critical blunder. About 2-1/2 inches of blunder. Had I made the walls a tiny tiny bit shorter, I could have used 6 foot long boards for the siding. This made a huge difference in the pricing since 1×12 or 1×10 redwood is already expensive, but longer lengths are even more so. 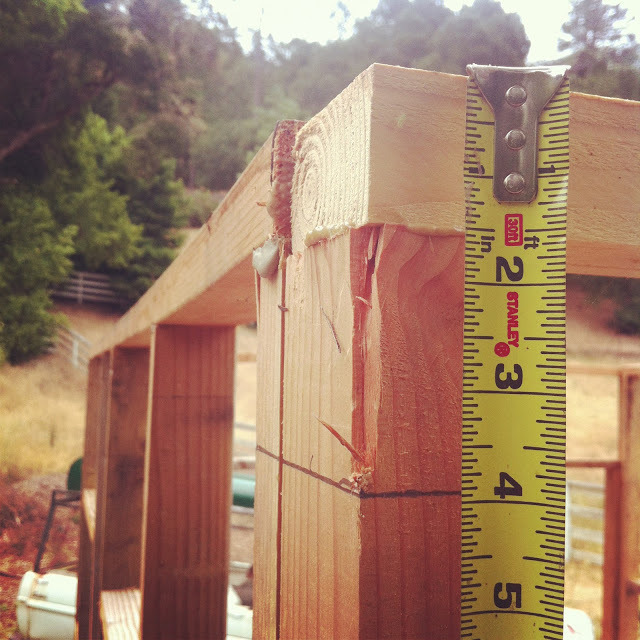 With 6 foot lengths, I could easily cut 12′ lumber in half, but the next common step up is 16′ lengths, which were much more spendy and wasteful. I cut the walls down 2-1/2 inches. 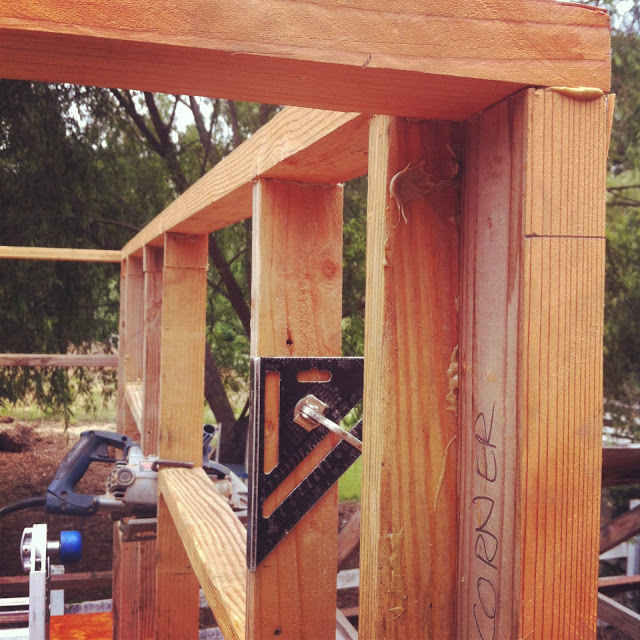 I clamped my carpenter’s square to each stud to serve as a guide for my skillsaw and cut a few inches off of each stud. Considering that everything was glued and screwed (or nailed), it wasn’t easy. 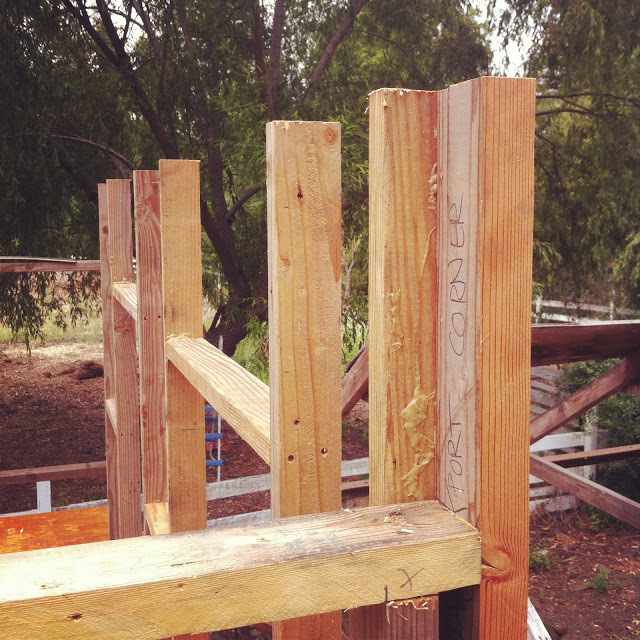 I had to remove the little stud nubs and glue and nail the top plate to the new tops of the studs. It only took most of a morning to fix the height of the cabin. Now the walls measure exactly six foot from the deck to the top of the walls. 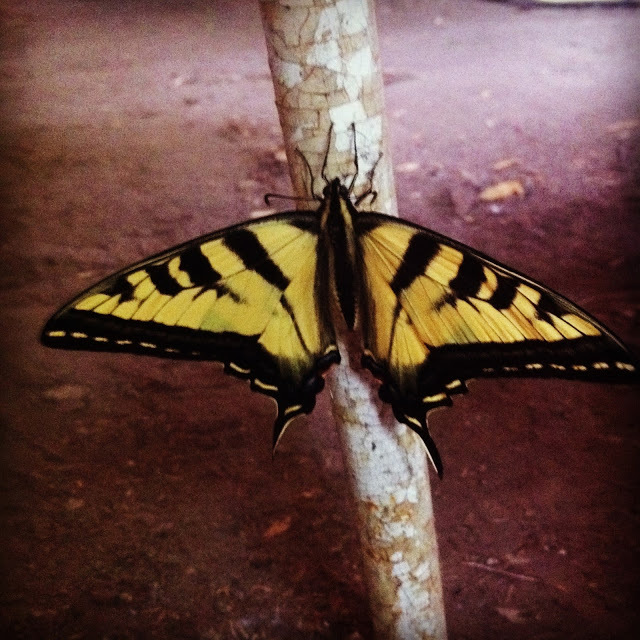 As a consolation for my troubles (and perhaps reward for conscientiously correcting my mistake), I had a beautiful visitor that day. 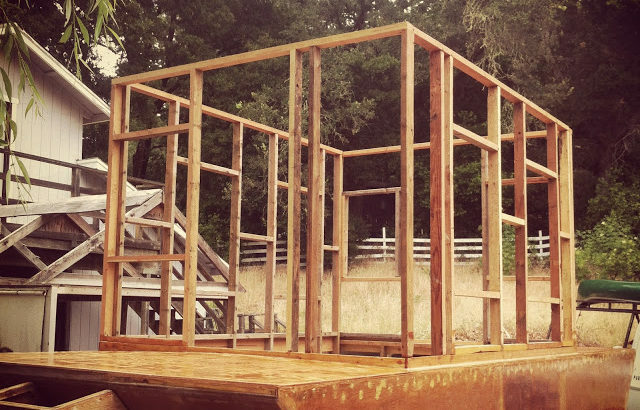 ← Cabin Wall Framing. Finally.